I wanted to challenge myself and see if I could pull of a week straight of wearing second-hand clothing/items! So, this past week, I put my money where my mouth is, and tried it. Since my wardrobe is not 100% full of second-hand clothing… I mixed in some clothing I already had in my closet. 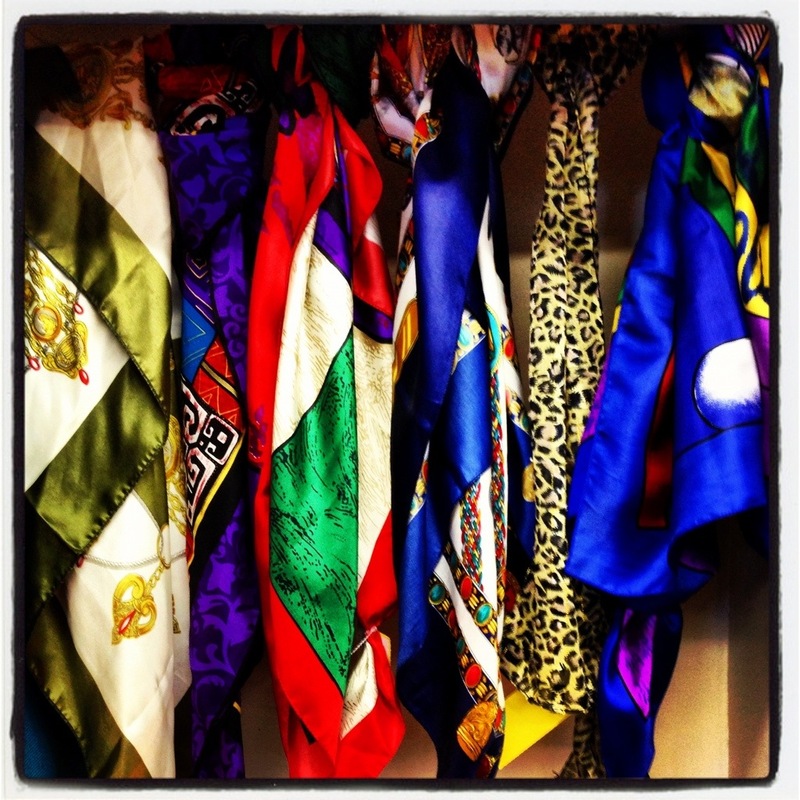 What I found was, challenge or no challenge, I usually am wearing a vintage or consignment piece of clothing! So, this really wasn’t a huge challenge for me. The true challenge would be wearing outfits (top to bottom) that are 100% from a second-hand store…okay, maybe not the underwear, but you get the picture. Either way, I had fun compiling these outfits and hope you see that you can shop second-hand and still be stylish and SAVE MONEY. Vintage Leather Clutch: Honestly, I have had this clutch for years, and I can’t remember what thrift store I purchased it at 😦 All I know is was under $10 and I LOVE IT! As you can see, I am a skier! As a thrifty gal I am always on the look out for great ski gear at decent prices. Check out my price for my GORTEX pants! Black Gortex Pants: Purchased from Second Time Around with the tags still on them for $25!!! These usually go for $230. 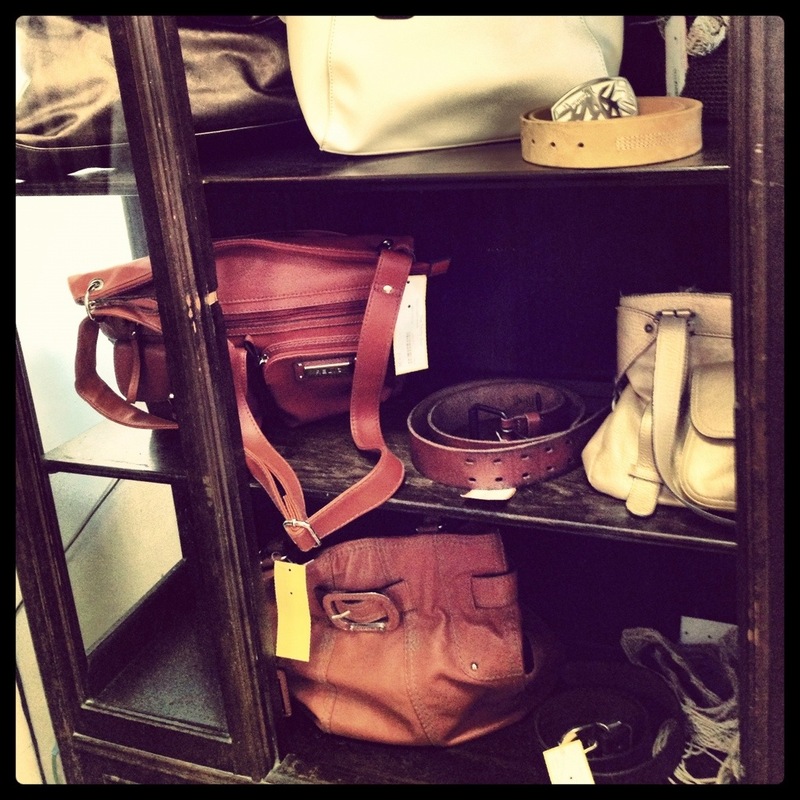 Thoughts: A quaint consignment shop with great finds! Recommend: They have womans, kids, an men’s clothing, so this is a spot for everyone. They do carry more woman’s clothing and accessories then anything else. A few weeks ago I hiked Mt. 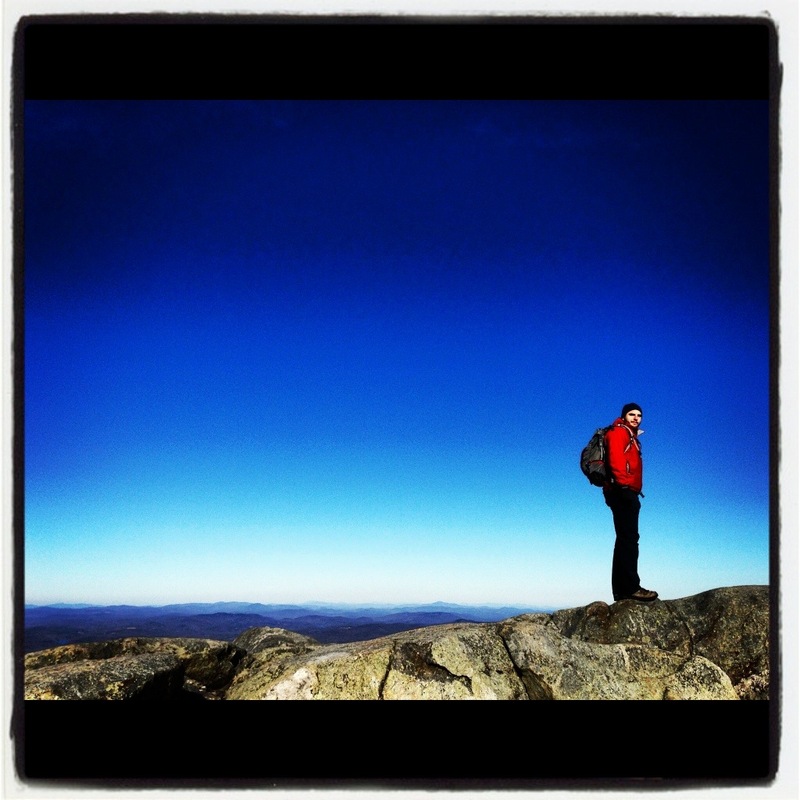 Monadnock in NH with friends and family. A great hiking spot for sure! 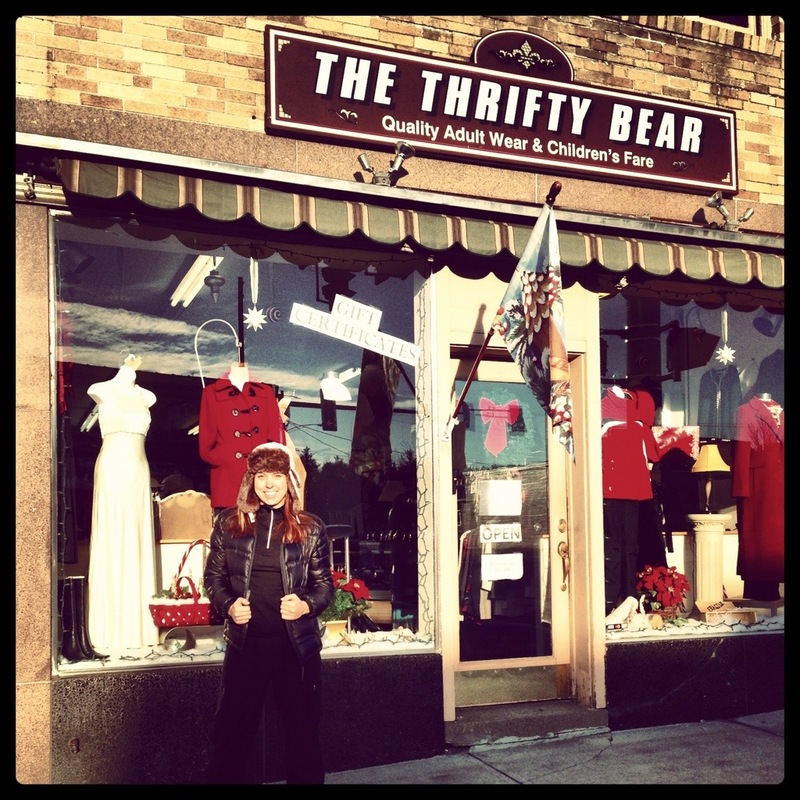 We got done a bit early so I encouraged a trip to The Thrifty Bear, which is located 10 minutes from the mountain. Here is a shot of Jeb from the top! My favorite shot of the day! Heading into The Thrifty Bear I didn’t know what to expect. 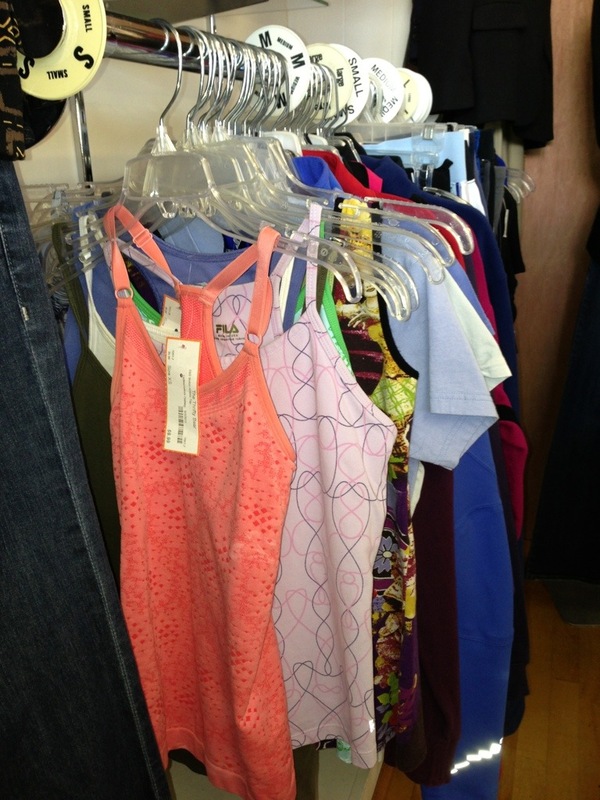 Immediately, I began hitting the racks, searching for quality and unique pieces. Turns out this cute shop is full of fabulous stuff! All well priced as well… Score! I continued along taking photos and introduced myself to the owner. Fun fact – she just took over the shop about a year ago and is looking to change the name… Any ideas? 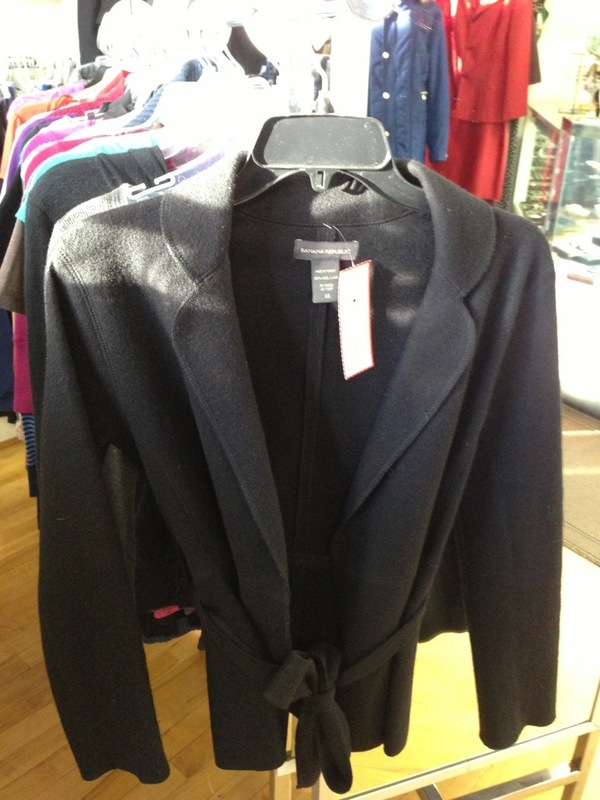 Paired with a nice top- all for under $30… Not bad for a Banana Republic Jacket! 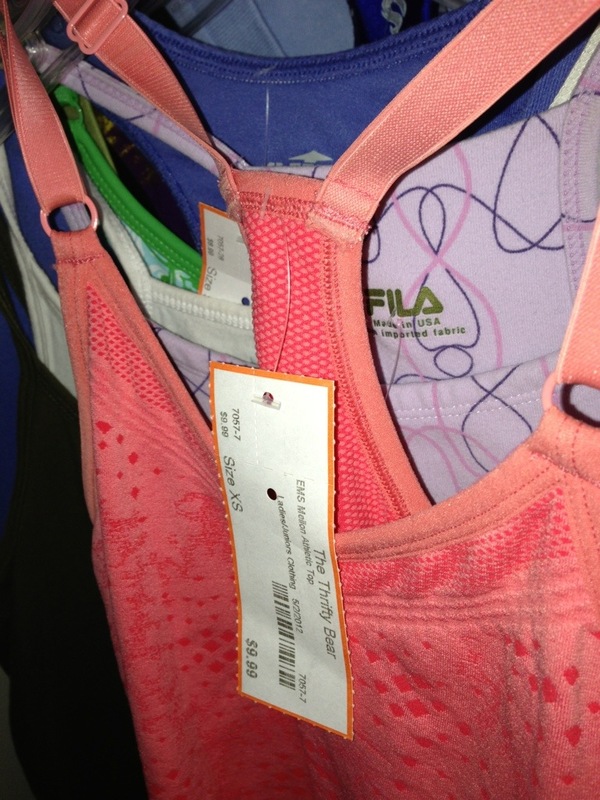 They also have a athletic attire section – love this!! 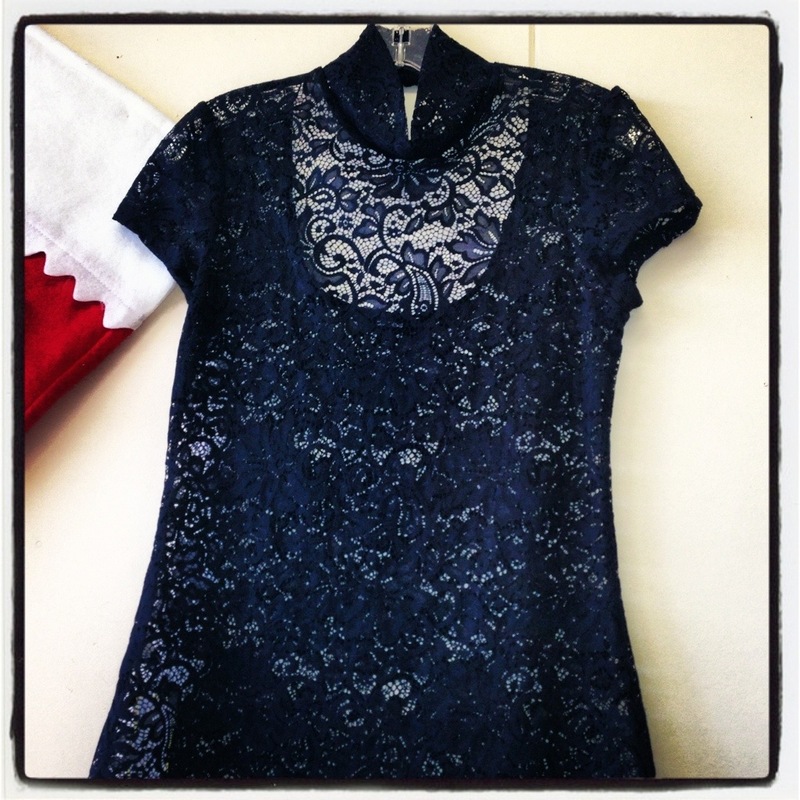 Looking for the perfect holiday outfit… They have it! They even had a men’s cave! Awesome for me, especially since I had two men shopping with me. Their outdoor selection of jackets was pretty good. While this section is not huge, they do carry solid outdoor brands. All and all this is a nice shopping spot! They are unique and certainly cater to many different shoppers. 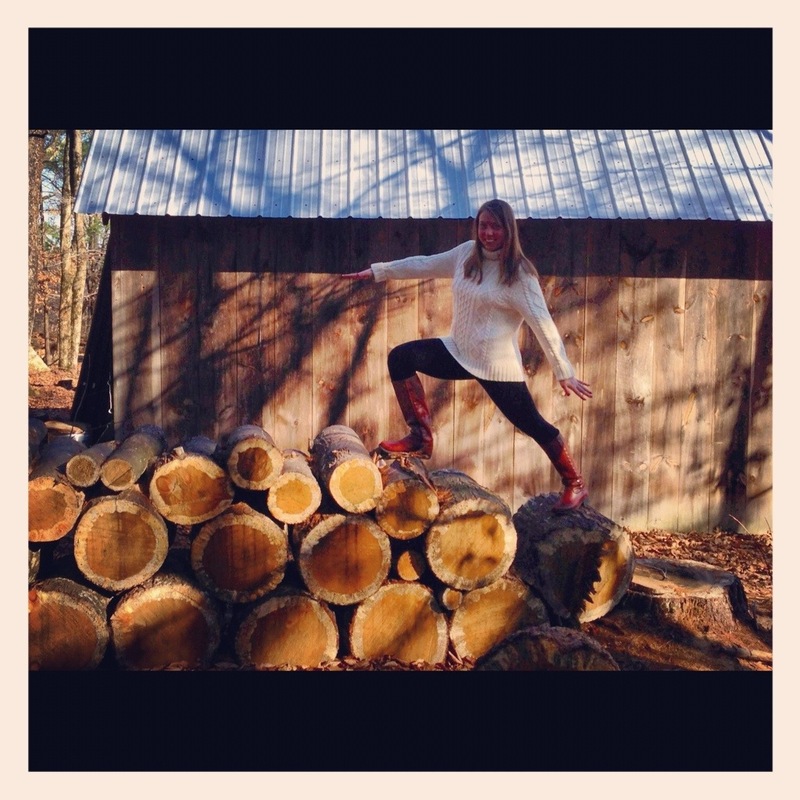 Check it out today… You could even hike Mt. Monadnock beforehand. Just sayin! 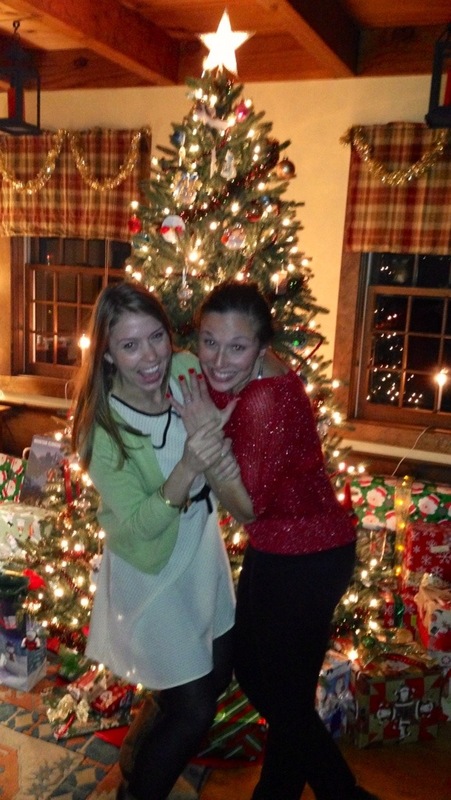 After our hike and shopping adventure we celebrated our friend Melissa and JR’s engagement!! Woo!! The weather and holiday made for the perfect opportunity to wear my new L.L. Bean sweater from BloomingDeals this weekend. 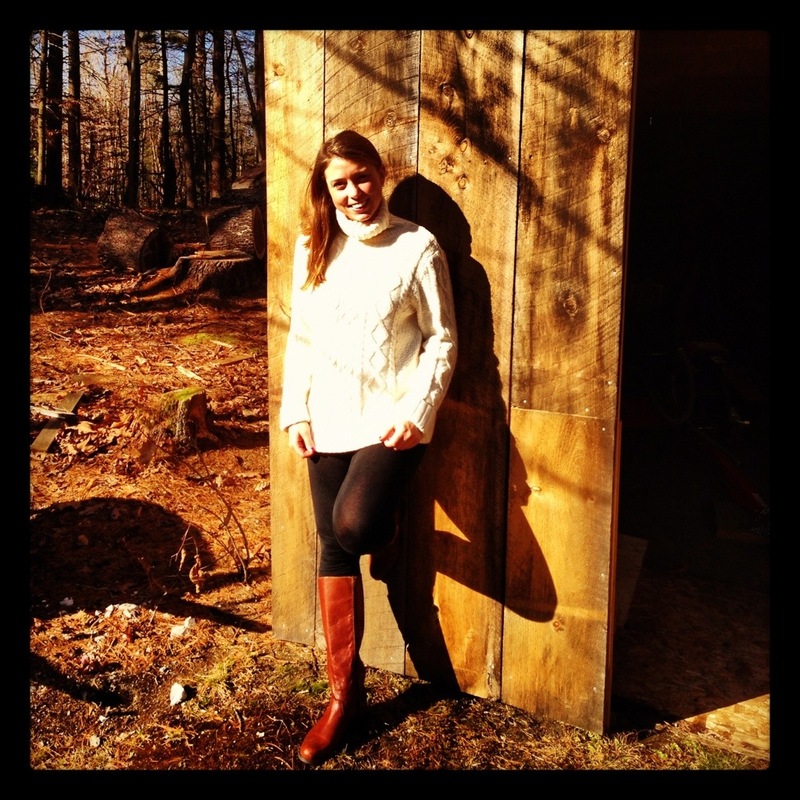 The sweater was a steal at $20, which paired perfectly (at least I thought) with my black leggings and brown boots. What I love about this sweater is how versatile it is; especially being from New England with five months of cold weather ahead of us. I can guarantee I will wear this more then a few times. 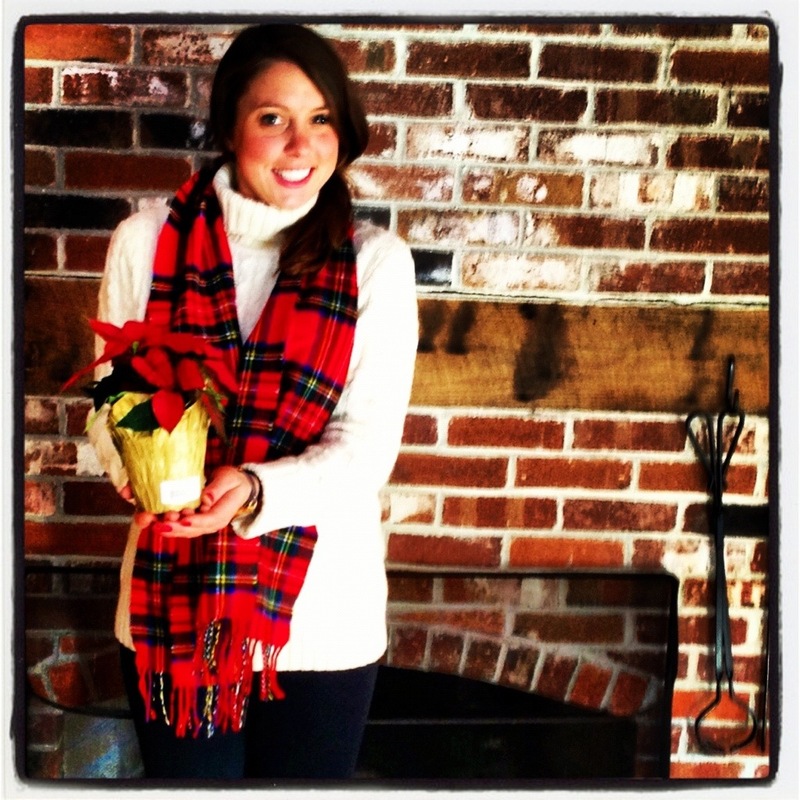 And I can’t forget about my cashmere scarf I got at BloomingDeals! 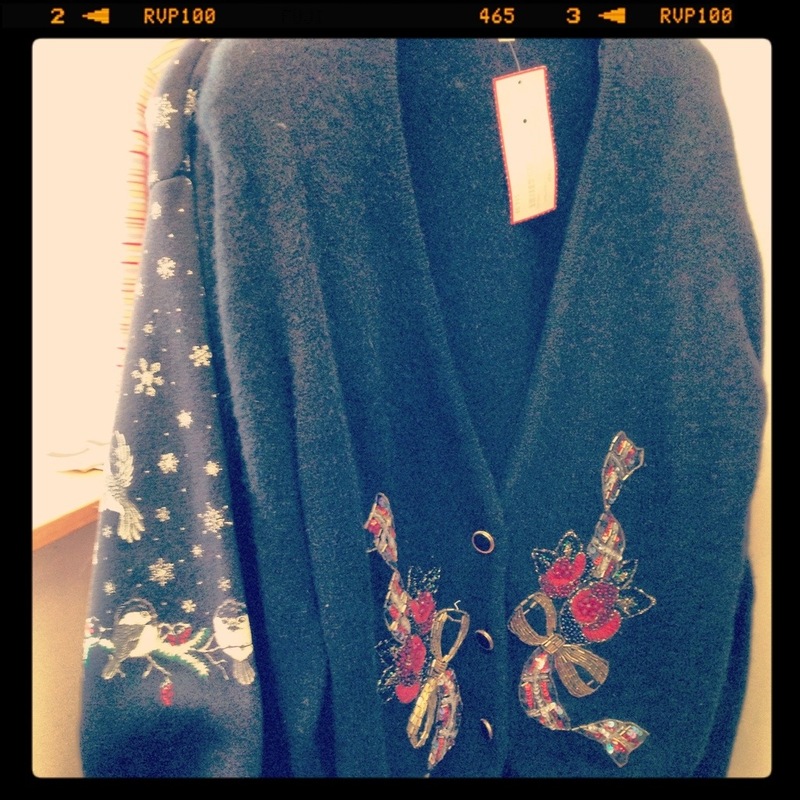 So soft and stylish, and for only $5. 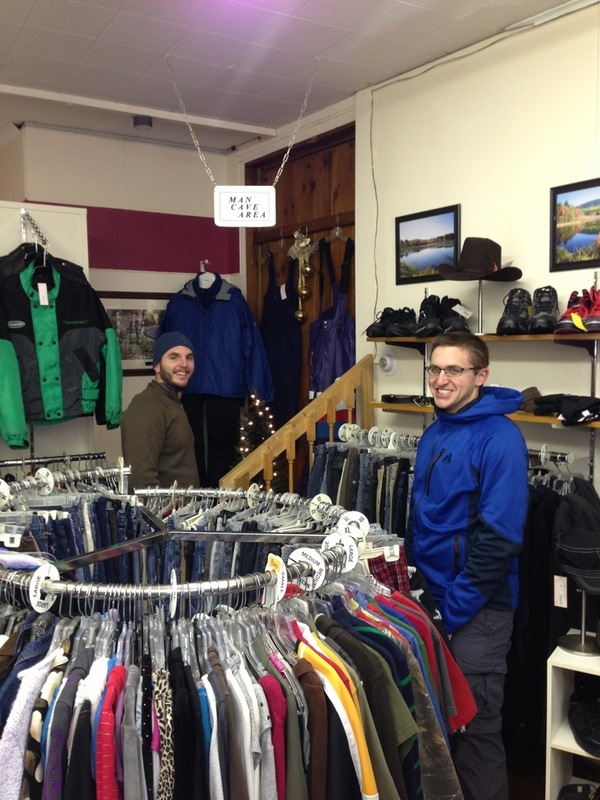 Overall thoughts: A retail store located in the heart of North Conway, that happens to have a specialty consignment store aimed at hikers and back country enthusiast in the basement. Recommend: If you’re into hiking and getting into the outdoors, go here. It can be hit or miss, but overall I have found great options to help me outfit me for the great outdoors. Over this past weekend I went camping and hiking in NH. On my feet were my favorite Asolo hiking boots and it dawned on my that I had to share my favorite consignment shop for getting fitted for the great outdoors. 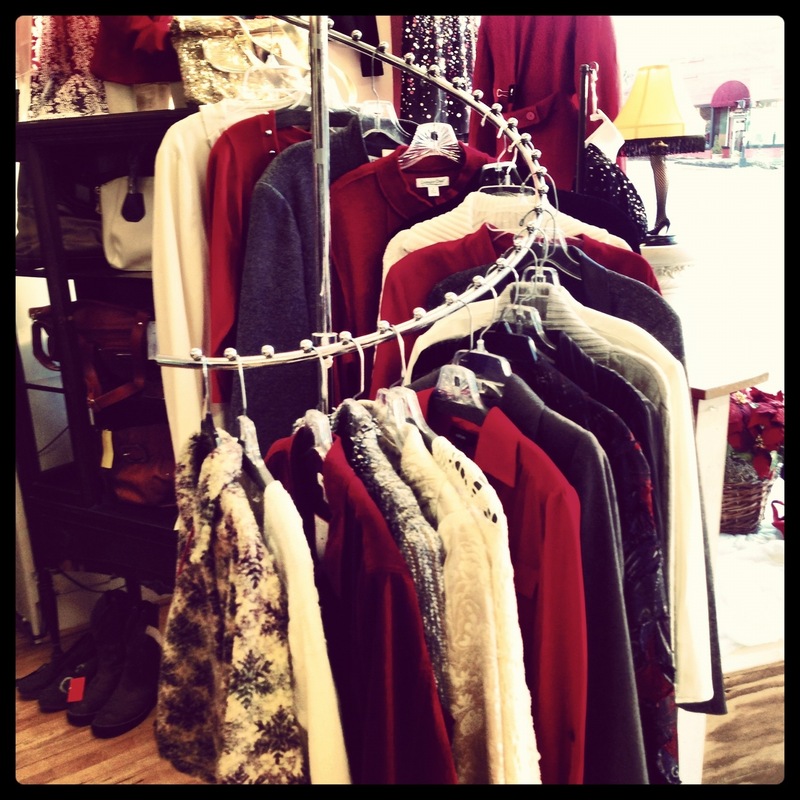 So here I am filling you in on a well kept secret consignment store in NH. I didn’t know this place existed until my boyfriend, Jeb, took me here looking for gear for our trip to Yosemite. 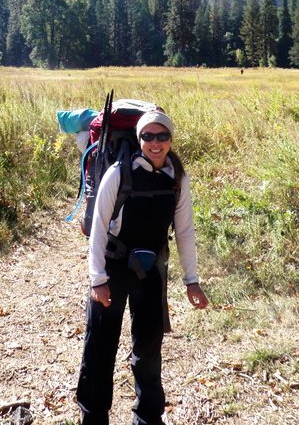 It was my first major backpacking trip… ok really just my first backpacking trip (LOL)… and I had to have the right look to conquer the mountains out West. This is when I found my Asolo hiking boots for $60, going for over $200 brand new and in great condition, I knew I had to take these to Cali with me. Here is I am ready to hike through Yosemite, wearing my boots none the less. Of course you can’t see the boots (who took this photo), but I swear they are on! I hiked in them for three days and my feet felt great throughout the adventure. I now where them on all my hiking expeditions. Here is a better shot of them! 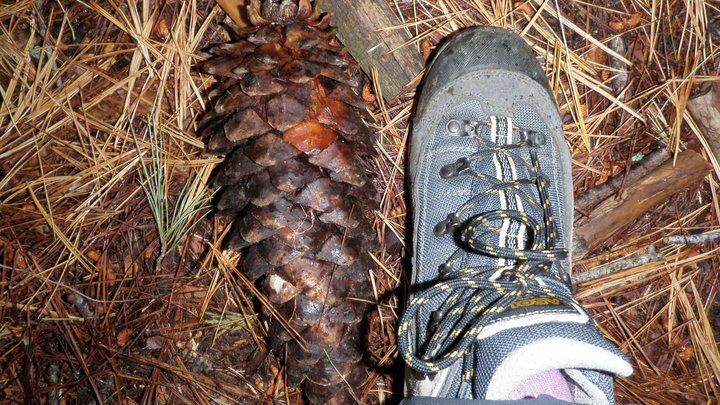 I was amazed at the size of the pinecones out there. My foot is not small either. Basically, I wanted to share this store with you so you could see that there is more than just fashionable clothing at consignment stores. This is a MUST stop for us whenever we go to North Conway, which is frequent. 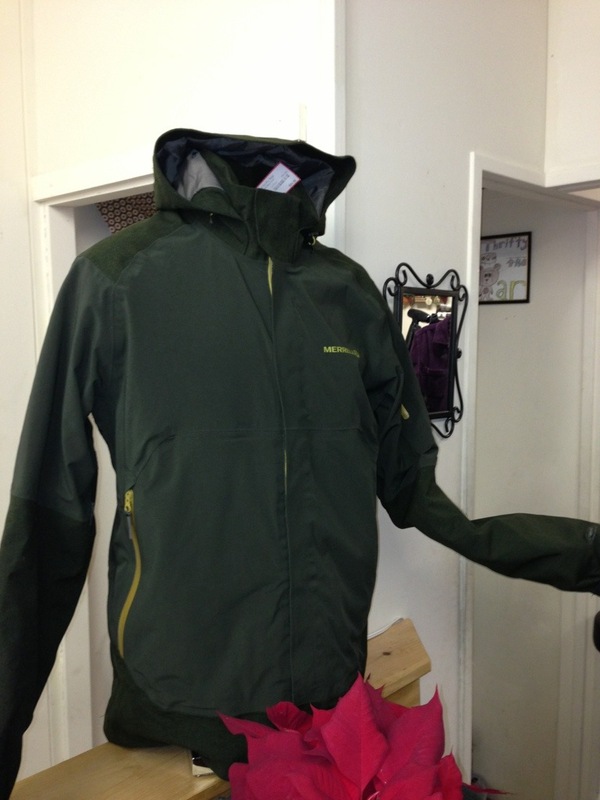 Again, it is in the basement of the retail shop (labeled IME), also supplying new back country gear. It is located next to the Eastern Slope Inn on the main shopping area of North Conway. 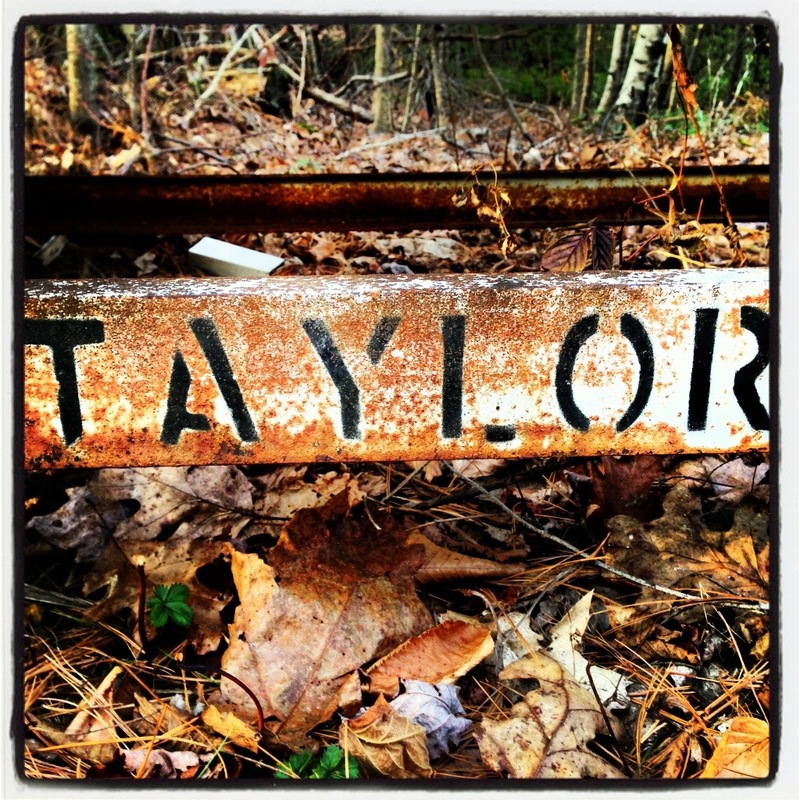 Check it out the next time you head to North Conway! 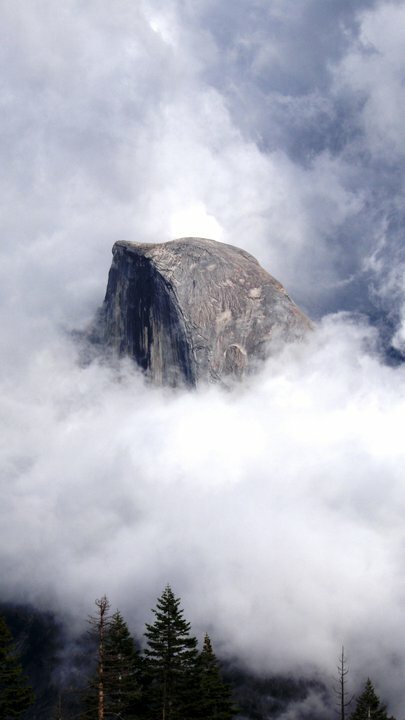 One more shot of Yosemite – Half Dome looking magical in the clouds! 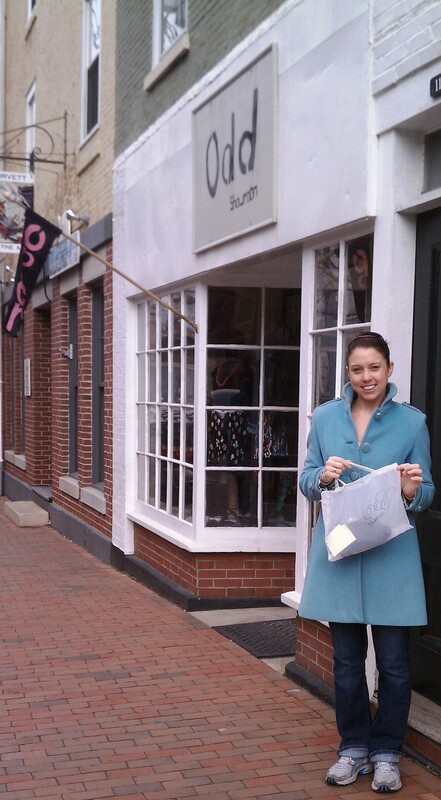 As promised, here I am wearing the blue slip I bought at Odd Showroom with my pencil skirt. 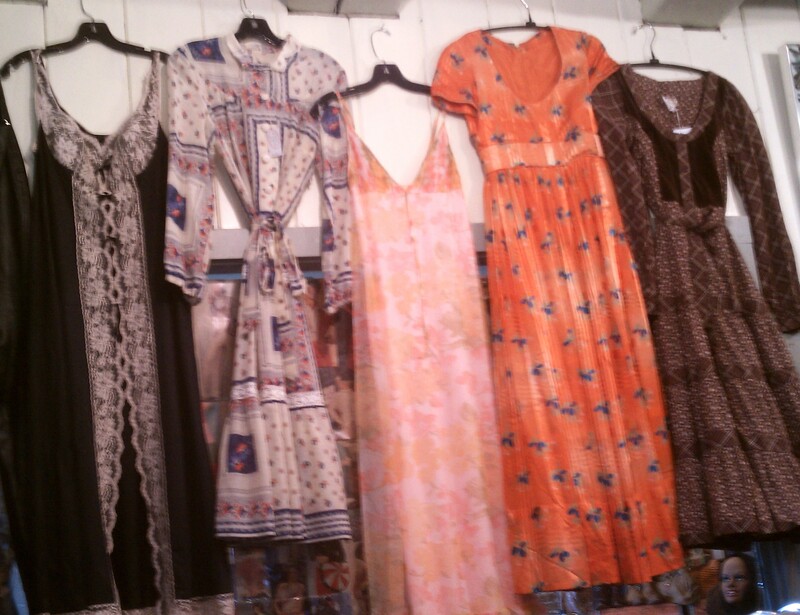 You can find great slips at many vintage stores and pair them with what is already in your closet! PS. The shoes (Nine West) are second hand as well. I bought them last year for $5. 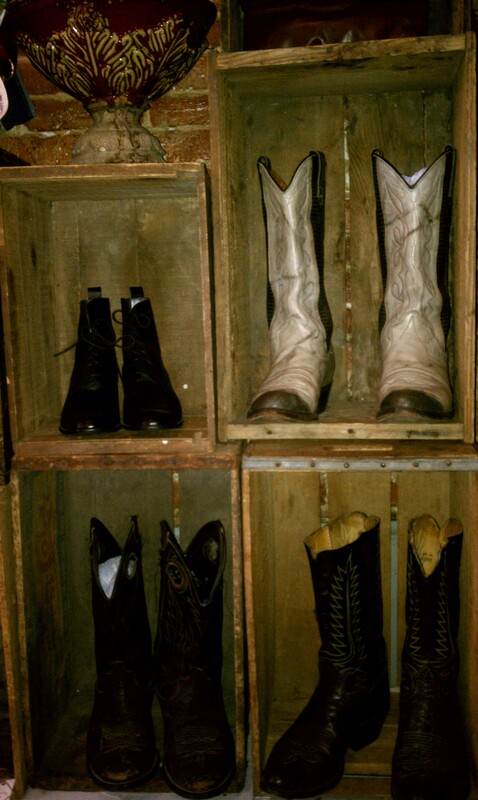 Recommend: If you’re in the market for a true vintage piece, cowboy boots or hand made gift this is your spot! This cute and cozy spot is located in downtown Portsmouth (a great location for thrift stores). My mother and I checked it out after my cousins wedding in mid March.. I told you, I wanted to get this blog going for a while now (ha). When we walked in it was very warm and friendly with clothing and boots you would never find in a department store. The owner, Amity Joy, was a great t person to talk with. Her father lives out West, so she has a great supply of cowboy boots in the shop.Cowboy boots are NOT easy to find at discounted price… buying these second hand makes so much sense.. they are already worn in and nearly half the price! The shop was not huge, but had quality one of a kind vintage picks.. you will not find a Gap or Banana Republic top here, making me love this spot even more. 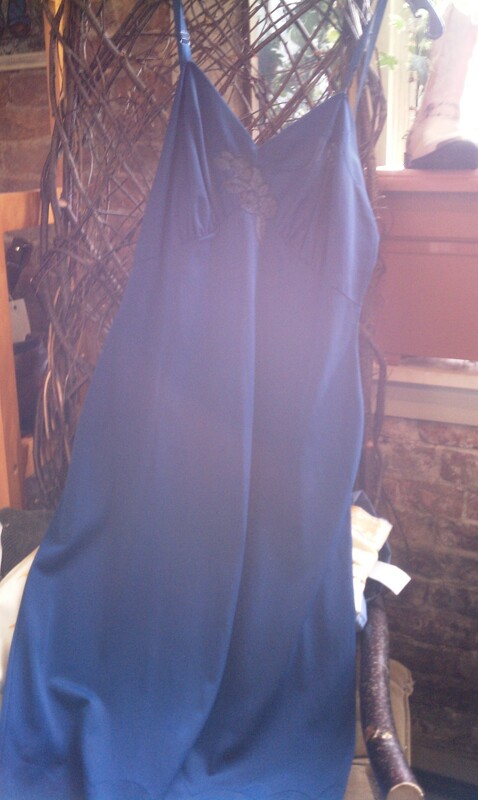 I found an amazing navy blue silk dress, very Mad Men like (actually wore it to a Mad Men premiere party) for only $15. Check out my photo of the dress below.. I plan on wearing it tomorrow to my work event with a black pencil skirt. So check out the blog tomorrow morning to see how it looks. One piece… so many ways! 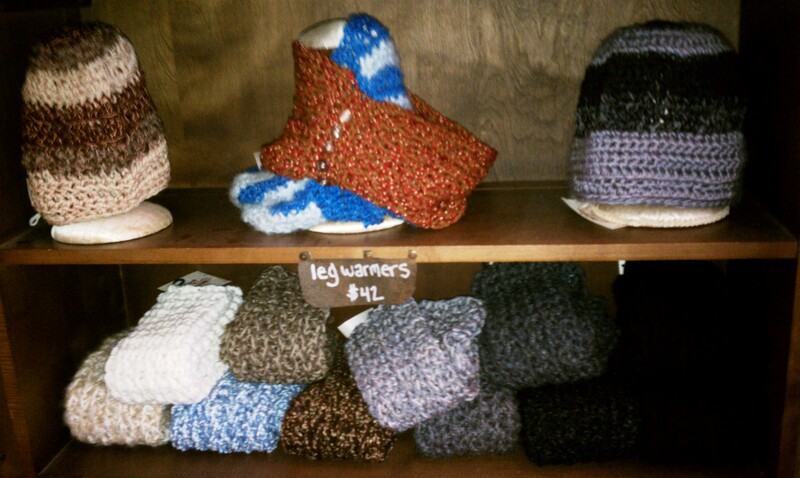 Amity Joy is creative soul herself, selling her handmade knitted sweaters, hats, leggings and bags. 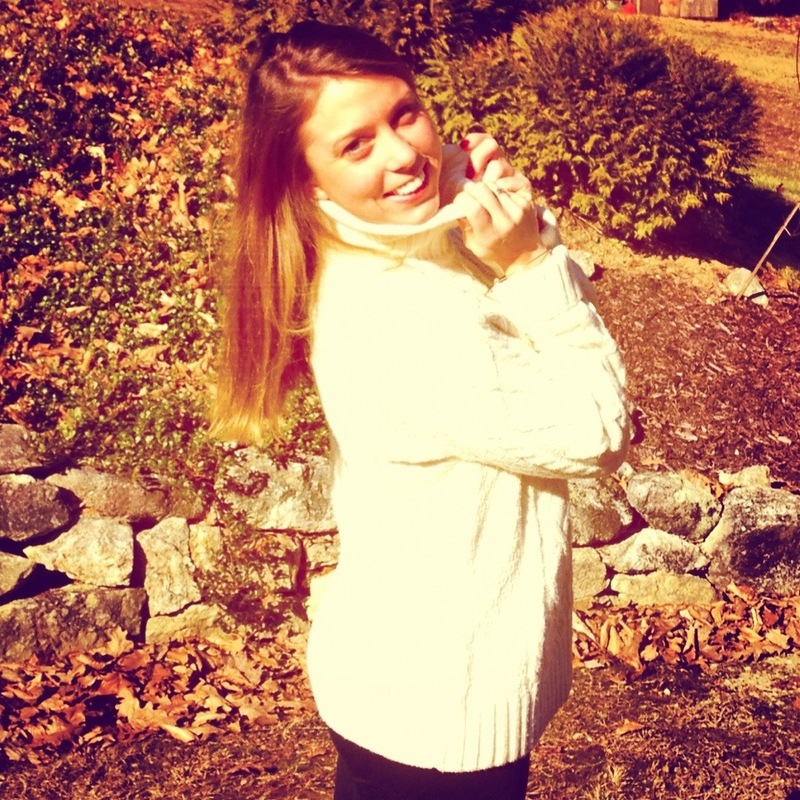 That head warmer is perfect for a cold New England day! 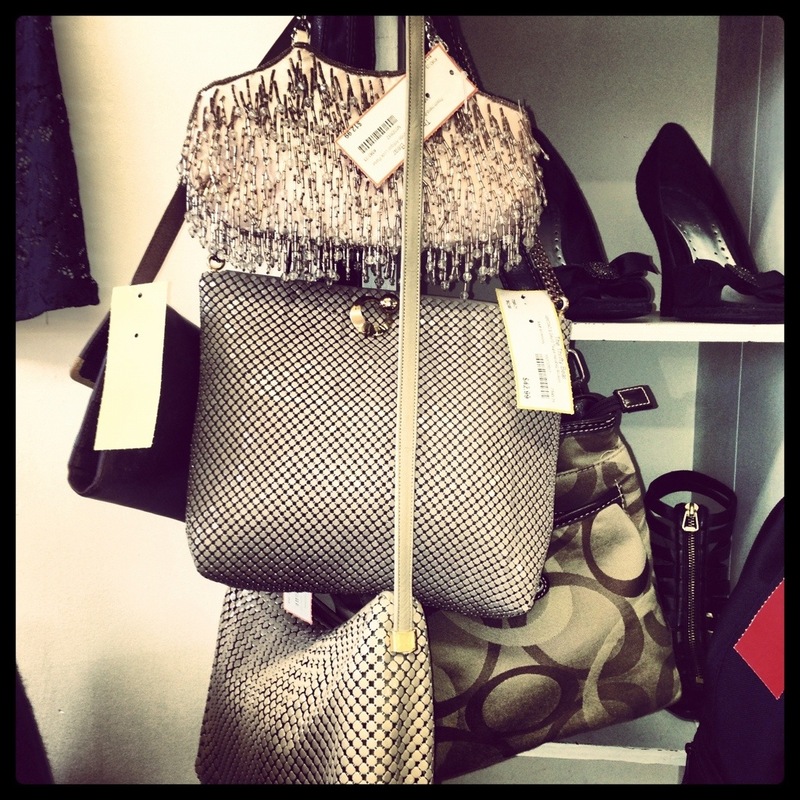 And the bags are made from fabric… not plastic!